If you sense a call to some form of ministry and would simply like to talk with someone about that call, we’d be honored to discuss it with you. contact us at your convenience. Trinity is Biblical — All degree programs are taught from an evangelistic, orthodox Christian worldview that is focused on service to Christ and His people, and firmly grounded in Scripture. Trinity is Flexible — The courses for our degree programs are offered in a variety of delivery formats to suit the individual needs of the learner, and are second to none in distance and online education. Trinity is Affordable — Trinity is dedicated to providing high quality education with tuition rates and financial grants that respect the needs of the men and women God has called to ministry. 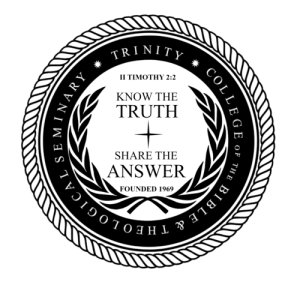 Trinity is You — The President, faculty, and much of the administration and staff of Trinity College of the Bible and Theological Seminary are experienced doers of ministry, and not teachers only. Check out the working pastors and educators who are Trinity students. With over 45 years of established, respected, and proven excellence in academic ministry training, we invite you to join the legacy of Trinity College of the Bible and Theological Seminary. Trinity College of the Bible and Theological Seminary is an online bible college, providing degrees in Biblical and Christian Counseling, Biblical Studies, Pastoral Ministry, and Philosophy and Apologetics. We are a completely 100% online Bible college, and our students can complete their programs from anywhere in the world they have an internet connection. Students can work at their own pace, and we have open enrollment all year long. Trinity students are Christians from all over the world who have the fortitude and dedication to earn their degree and sharpen their ministry, while still remaining where God has called them to be in the world. We have a variety of course delivery styles, so that our students can choose the one that works best for them. Our Independent Study courses allow students to work on their own, completing assignments at their own pace, allowing for the ups and downs of life in ministry and mission work. Our Online Courses are more structured, having weekly assignments, and a beginning and ending date for the course, allowing for more interaction with faculty and other students through non-linear discussions. Finally, our webinars are live audio and video lectures, delivered at a set time, that allow students to interact with faculty and other students just as they would in a face-to-face environment. We are founded with the goal of providing flexible and cost effective theological education. No quality school will surpass us in that pursuit! Many Christian colleges and seminaries are too expensive for the average person. But with Trinity, Christian college and seminary is affordable. Call an academic advisor at 800-457-5510 to learn more, or fill out an academic evaluation online and our advisors will be in touch. We hope you will find Trinity College of the Bible and Theological Seminary to be the right choice for you. Our flexible and expansive programs help those in ministry, or those just wanting to learn more of God’s word, to go deeper into the Academic City of God while continuing to work and minister in the world. "Trinity was founded on a commitment to providing matchless theological education in a cost effective and flexible way so that the Christian servant can continue their work for the Lord in their own ministry context. "